Floor Sanding Clapham SW4 | 15 Years of Experience! Do you have a stain on your wooden floors you can’t remove? A scratch? Creaky Boards, that ruin its beauty? It’s time to consider a more professional approach to your wooden floor maintenance. Choose our floor sanding in Clapham SW4 for an immediate and long lasting effect. Erase the passage of time on your wooden floors with one single call at 020 3404 9697. The service is suitable for every type of wood, be it hard or softwood, and every style of floor – floorboards or parquet. Restoration and Repair: Your floors will be inspected and all loose boards or damaged boards that need replacement will be fixed. Gap Filling: All gaps are filled with organic materials. Floor Sanding: The old seal and finish are removed. Every damage is gone for good. Staining: We change the hue of your wooden floors if you want us to do so. This step is up to every client. Finish: Your floors are sealed with an organic sealant – lacquer, oil or wax. After that, your floor is ready for use! Easy to clean: Freshly finished wood floors are extremely easy to clean. Beautiful: All guests at your home or office will admire the new look of your floors. Healthy for a long time: Longevity is guaranteed if you treat well your freshly sanded wood flooring. Increasing the Value of your property: Most real estate agencies claim properties with wood floors sell much easier on the UK marker. All the technicians are BONA-certified. They know how to restore your wooden floor to its former glory as fast as possible. 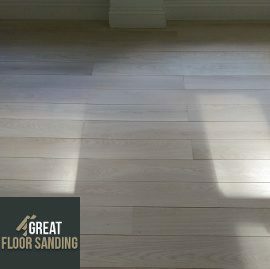 We work at floor sanding in Clapham with precision to ensure your flooring is perfect. The wood will last for years ahead. We have the latest BONA equipment, which promises a quick result and spares you the nuisance of sawdust. Once done, you can freely return and resume your life with ease. Request your on-site viewing about wood floor sanding right now. Call 020 3404 9697 – the rest is up to us! You can contact us at any given moment during the week 24/7. You can call us anytime to make alterations to your scheduled appointment or request an update, or use our contact form or chat feature.